Receive occasional notice of our new releases and special offers. Your address won’t be traded or sold. Mondragón Cooperative Corporation - Begun in the 1950s, the Mondragón co-ops have transformed a depressed area of Spain into one of the most productive in Europe with a high standard of living and an egalitarian way of life. They are owned and managed by their workers. Seeing the achievements of the MCC helps to overcome the idea-widespread in North America-that worker run cooperatives can only exist on the economic fringe. The Evergreen Cooperatives in Cleveland, OH - This is an ambitious urban redevelopment model, directly inspired by Mondragón, where local institutions and public officials are supporting green cooperatives of previously marginalized, predominantly African American workers, who provide commercial laundry services, install solar energy systems, and grow vegetables in vast urban greenhouses. 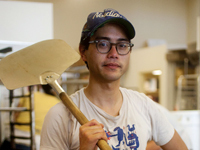 Arizmendi Association of Cooperatives, San Francisco, California - Started 30 years ago, there are now six of these independent worker owned and managed cooperative bakeries that work together to provide the financial and legal services they need, and to incubate new coop bakeries. Equal Exchange, Boston MA: Founded in 1986, Equal Exchange is one of the largest roasters of fair trade coffee in the world. Other films by Mark Dworkin and Melissa Young are We Are Not Ghosts, Good Food, Argentina: Hope in Hard Times and Argentina: Turning Around, Net Loss, Another World is Possible, Not for Sale, Gene Blues, Islas Hermanas and Risky Business. "This is a very important film on a very important topic that is almost completely neglected by business schools. As our current economic structures veer ever closer to collapse, the cooperative alternative has become more important and more attractive. Seeing the sophistication of these businesses and listening to these co-op member/owners talk about their work is totally inspiring. Another world IS possible - and it looks like this!" "Shift Change offers us living examples as well as an inspiring vision of what a productive, just, and sustainable economy can look like. The film's core message can help to build bridges across different groups who are united in their commitment to the economic vitality and fairness of their own communities. The overall message, the cases, and the analysis are exactly what we need to help chart pathways out of the global economic crisis." "One of the barriers to fostering cooperative values and businesses in North America is the lack of awareness of the benefits that well organized cooperatives with good business practices can offer to workers and communities. Educating the public to the cooperative approach to business is an important contribution which Shift Change can make." "A refreshing and thoughtful response to those who argue there are no better or even viable alternatives to our current for-profit, top-down market-based economic organizations...The film exposes the viewer to the wide range of workers (from highly skilled engineers to newly arrived immigrant workers) as well as workplaces (from household appliances to industrial laundry) engaged in cooperative production. Shift Change could easily be used effectively in economics, sociology, political science, and management courses." "A first-rate documentary...A unique educational film. Shift Change persuasively demonstrates the success of worker cooperatives in building industry through democratic ownership that also paves the way to advancing new forms of democracy in capitalist society. What makes the film so convincing is the overwhelming evidence that is conveyed to all that cooperatives are imperative in advancing the American Dream of worker control and democratic governance. Shift Change is a sweeping and indispensable documentary!" "The world has changed but most businesses are still run as they if it were last century with a few on top operating with as little concern for their workers as for the community or the environment. Fortunately, against this model stands a vibrant group of worker cooperatives stretching from the Basque region of northern Spain to the rust belt cities of Cleveland, Pittsburgh, and Madison Wisconsin. Shift Change tells how workers are creating a new business model, one that is democratic, egalitarian, and concerned for the community; a model that is also, ultimately, more productive because it draws on the talents and the skills of the workers themselves." "The basic purpose of Shift Change is to encourage the development of work cooperatives in North America as one solution to our severe economic problems as well as a means for a regional economy to compete successfully in the global economy. We at the CMRC can see using the documentary in many ways." "An uplifting film that offers cross-cultural perspectives on worker-owned, worker-run businesses. This film would be appropriate for courses dealing with issues of social class, the economy, social change, or worker rights." "This is an essential introduction to worker-ownership. The film presents the building blocks of cooperativism, from the pleasure and pain of group decision-making to the process of building networks of coops, clearly and compellingly in the words of worker-owners themselves." "Brilliant...For the labor movement, the film opens up the interesting question of what would a union worker cooperative model look like. In an economy where casino-like investment decisions are rewarded and outsourcing of employment hurts us all, worker cooperatives present a healthy alternative to business as usual and the usual types of businesses." "Highly recommended...Fascinating and inspiring. While viewing this, one may often find oneself asking, 'How can I get started?' The film not only lays out a blueprint for success in forming a progressive cooperative, but encourages the practice as a manner to establish a community consciousness...Addresses such issues as wage pressures, competition, and globalization...A beautifully crafted film." "This documentary should become standard viewing for any course devoted to the anthropology of work, as well as topics such as urban anthropology, anthropology of the United States, and economic anthropology...Be prepared for spirited discussion. If it does not come automatically, be prepared to incite it. You might consider putting some of the principles discussed in the film into practice in the classroom...Support for cooperatives in the United States could rescue some of our dying cities, make irrelevant the last vestiges of our vanishing labor movement, and realize some of the fine values articulated in our founding political documents and the speeches they inspire. Your classroom is as good a place to start as any." Case studies of individual coops including some not in the film, SDH captions for the deaf and hard-of-hearing and scene selection. The first in a new series from the makers of SHIFT CHANGE, WEconomics: Italy reports on the extensive and innovative cooperative economy in the region around Bologna. An intimate view of new models of work, politics and community development in Argentina. The Argentine people, in the face of economic collapse, provide a hopeful example for the rest of us. The deep history of cooperatives in America -- the country's longest-surviving alternative economic system. The story of Mott Green and the solar-powered Grenada Chocolate Company, a farmers' and chocolate-makers' co-op, which makes organic chocolate from tree-to-bar. Looks at the benefits of fair trade goods and product certification for people and the environment. Economics and its relation to social change and our lifestyles. Marilyn Waring demystifies global economics from a feminist perspective. What's the Economy for, Anyway? Ecological economist Dave Batker questions whether GDP is an adequate measure of society's well-being and suggests workable alternatives. Forest communities can have both jobs and trees. "This solutions-oriented documentary could breathe fresh air into classroom discussion on issues that all too often appear static and unchanging. Classes in sociology, political science, and economics could use the film to prompt discussion of cooperative structures and participation. Students will be challenged to think through the social and economic implications of alternatives to corporate capitalism...This highly accessible and engaging film could introduce students to worker owned cooperatives and inspire them to imagine an alternative, better, fairer, and feasible economic structure." "One of the most powerful messages of the film is the importance of symbolic power in creating alternatives to mainstream economic models...People have to see real examples to believe in and want to build the alternative...The film is well done. It provides an overview of a range of cooperatives emerging in the US and demonstrates the importance of Mondragon as a beacon of inspiration." "A timely documentary..Offers an energizing look at the workings of the giant cooperative model, Mondragon, in Basque, Spain. The film also covers strong US-based worker-owned enterprises that prove the investor Wall Street model of business is not necessary to a successful company." "Shift Change brings you behind the scenes at some of the most exciting cooperative successes in Europe and the United States. This is a movement that's creating jobs, strengthening communities, and showing that another economy is possible. It's a movement that's taking off--and this film is the way to understand what's happening." "A vivid example of pro-worker businesses...Shift Change offers a bright ray of hope for a sustainable, worker-friendly way of life. Highly recommended"
"An exciting premise - workers are more motivated when they own a company, rather than when they just work for it...Viewers are exposed to the interiors of many factories as people working at various levels are interviewed. Employees are thrilled to be sharing ownership." "An upbeat message...Makes an interesting argument for the benefits of this alternative business approach. Recommended." "The phrase 'worker cooperative' probably evokes vague notions of overseas Communism, small-time craft vendors, or the organic grocery store around the corner. Underneath that cultural baggage, though, it's a pretty simple idea: Whatever the enterprise, every employee who qualifies has a vote on business matters and is invested in the company...Shift Change argues that in an economy where not much is certain, it's worth considering different ways for ordinary people to join forces in the name of profit." "How would work be if everyone had an equal say in the success and development of a business? Can democracy in the workplace translate to a successfully run company?...Through in-depth interviews with members of employee-owned companies across the United States and in Spain, the filmmakers succeed in helping to frame the debate about work and business development in a more humane light."